PARIS, France — An important series of cultural event was launched by Crown Prince Naruhito on September 12th 2018 in Paris, to celebrate the 160 years of diplomatic relations between France and Japan. One of these Japonismes events was the setting up of several tasting sessions in Paris, in order to evaluate and rank premium teas from the 2018 harvest. These 19 cups had previously been selected out of around 400 teas as the best of the various categories by a jury of local tea professionals during the annual national Nihoncha competition, established 5 years ago to enhance and promote premium quality. Taking the final round of the 2018 Nihoncha competition to Paris was a brilliant opportunity offered by the Japonismes festivities. To attract more tea professionals, it was scheduled during the big International Food Fair- SIAL, held in Paris from October 21st to 25th. The tasting sessions were run in the prestigious environment of one of the Paris boroughs town halls and in the famous chef school “Cordon Bleu Paris”, near the Eiffel tower. The participants were welcomed by the Chairman of the Japanese Tea Instructors Association and the 19 cups were then presented to the participants by a Japanese brewing team. The tiny cups offered about 5 sips each, and the evaluations were to be noted in a provided ranking sheet. Too little time for some of the incredibly savory cups, sighed some attendees, all impressed by the smooth logistics and the diligent and smiling brewing crew. Although it was a blind tasting, some categories could be identified amongst the ten, which are: the 4 types of Sencha teas, normal and deep steamed, grown in full sun and partially shaded, Gyokuro, Tamaryokucha, Kamairicha, Hôjicha, fully oxidized teas and partly oxidized teas. 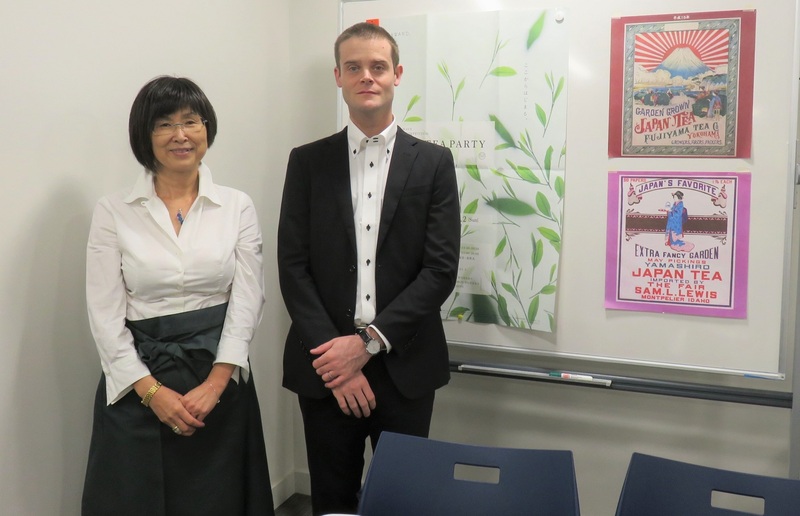 Whilst the operation was centrally managed from Tokyo, the French Ambassador for Japanese green teas, Ms.Misako Lelong Nohsoh, in charge of the Paris set up was supervising and giving a helping hand. The Master of Ceremony was Mr. Florent Weugue, who is currently the only French national qualified as Nihoncha Instructor, who had travelled from his Tokyo office, to ensure good communication between the Paris tea lovers and the French tea professionals and the Japanese tea delegates. A memorable event, which will assist with making the Japanese premium teas better known in France, where genuine and specific terroir tastes are well understood and highly appreciated. In line with the rating results from the Paris tasting session an ultimate Japanese Jury will consolidate and validate the selective process within the next weeks. The final result naming the Nihoncha Paris 2018 winner cup is expected to be announced by early November.